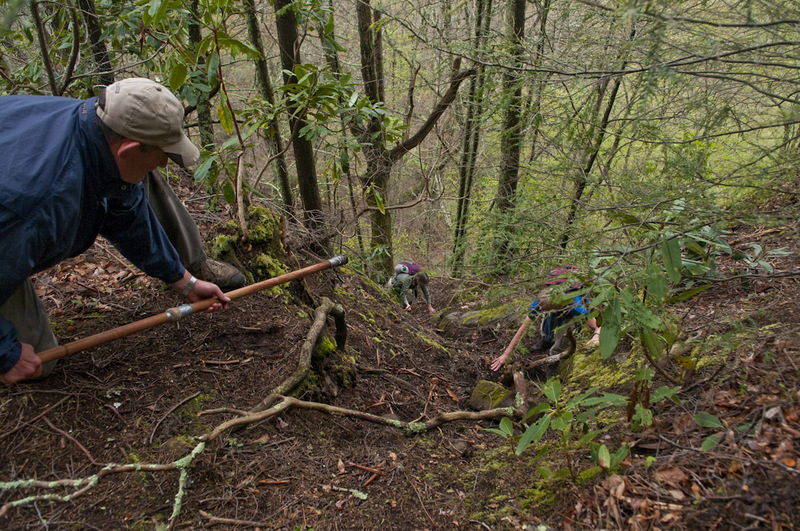 Hiking in the Smokies is always an adventure, but some treks are more memorable than others. 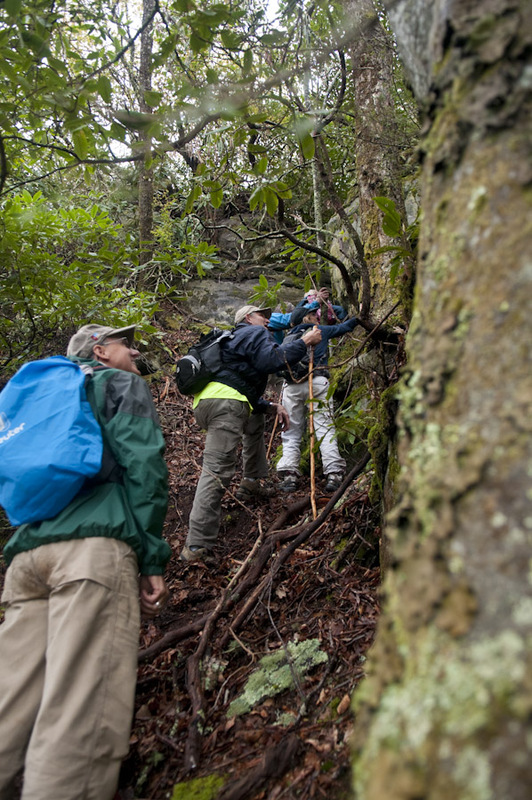 Today’s Pilgrimage walk will follow a faint roadway past old farm sites, bushwhack the steep slopes of Greenbrier Pinnacle, scramble on all-fours up rocky cliffs called the Cat Stairs, and defy thunderstorms with quarter-sized hail. Yee-haw! Sign me up! At breakfast this morning, Pilgrimage leaders are hunched over smart phones watching an impressive line of thunderstorms bearing down on Gatlinburg and the park. The storms are moving fast, and there is nothing on the back side. They should safely pass and pose minimal delays to the start of scheduled programs. Ken Wise, author of Hiking Trails of the Great Smoky Mountains: A Comprehensive Guide, is our program leader. Ken has hiked the park’s terrain on- and off-trail countless times and studied its cultural history. His knowledge and confidence in these mountains are impressive. So is his hiking ability. I offered to be a co-leader to meet Ken and experience the Pinnacle under the guidance of someone who knows all the old and little-used paths slowly disappearing as the park matures. Clarence and Mary, my bestest hiking buddies, are coming too. Clarence arrived early to help with Pilgrimage preparations and co-led a salamander hike yesterday. He is an acknowledged third leader today and volunteers to bring up the rear as sweep. Ken, Clarence, and I drive to the picnic area on Greenbrier Road, where we will meet our Pilgrims to carpool. The storm is in full fury, and everyone waits out the heaviest rain and lightning in their cars. Wrapped in raincoats or hunkered under umbrellas, we gather in a circle to discuss the day’s plans. 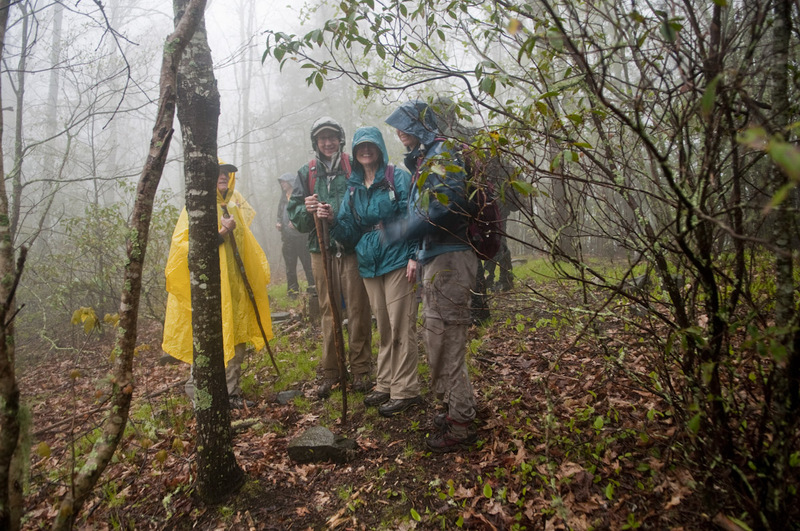 Seventeen people signed up online for this hike, but only nine brave the weather. Counting Mary and the three leaders, we have thirteen people ready to hit the trail — a perfect size. 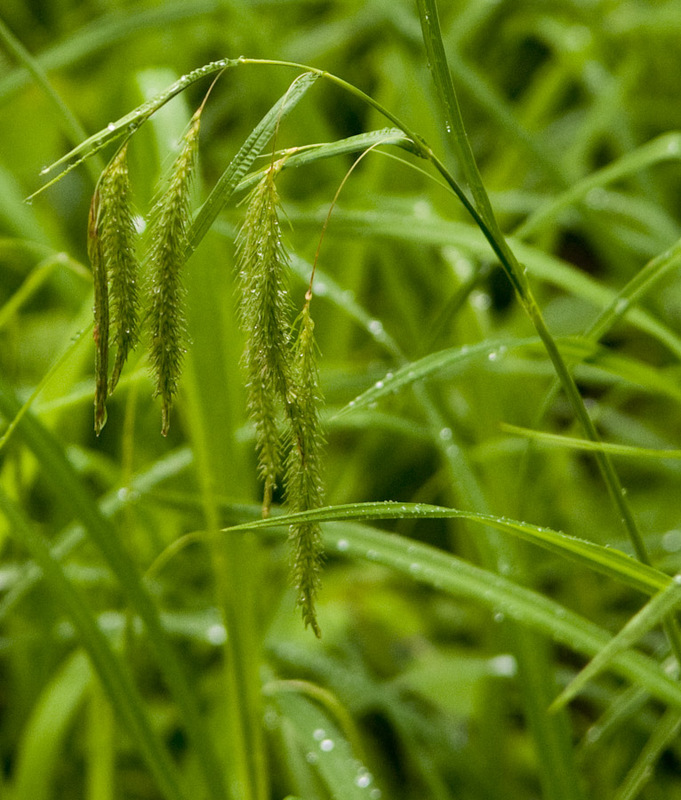 Wetland sedge on Barnes property – perhaps Nodding Sedge. The old wagon trail off Ramsey Cascades Road is barely discernible, and we disappear into the greening forest. At the beginning, the manway passes old stone walls and former farm fields now full of dying Hemlock and other tree species. We cross Bird Branch and pause at an old home site where Ken shares some of Greenbrier’s rich history as a once thriving community. One of Greenbrier’s residents around the turn of the last century was John Barnes. Listening to Ken, it is obvious he was a rather eccentric character, someone who preferred the company of the mountain to neighbors. We make our first real climb to the pond, cemetery, and cabin site on John’s property. The landscape levels noticeably here. 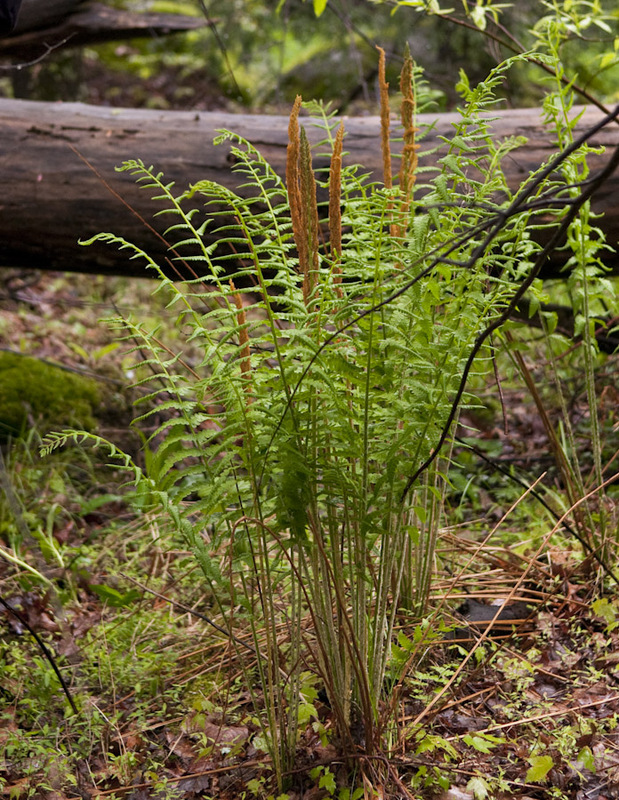 A small spring fills a depression, and Cinnamon Ferns grow around it. A short walk beyond is the quiet resting place of three of John’s daughters – Posey, age 7, Julies, age 2, and Delia Lenora, 14 months. 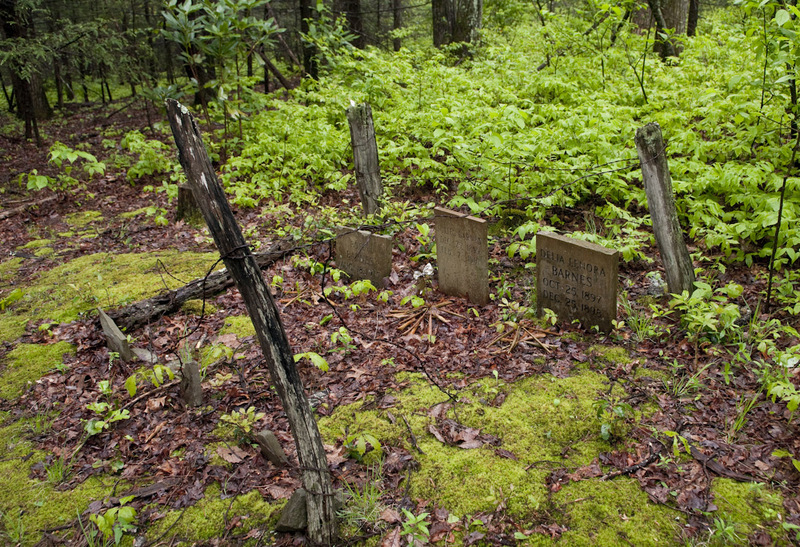 The Park Service has erected new headstones to replace the original broken, etched rocks. One of the four barbed wire fence posts encircling the tiny cemetery has fallen over. The cabin site is marked by the lower half of the homestead’s chimney. Part of an old iron stove leans against the stones. This site overlooks an open field full of sedges. According to those who’ve visited before, the field often stays wet and marshy, which likely contributes to the lack of woody species. Sedges are devilishly difficult to ID, but there are only a handful of species that look similar to the plants in this field. I will hazard a guess of Carex gynandra, Nodding Sedge. 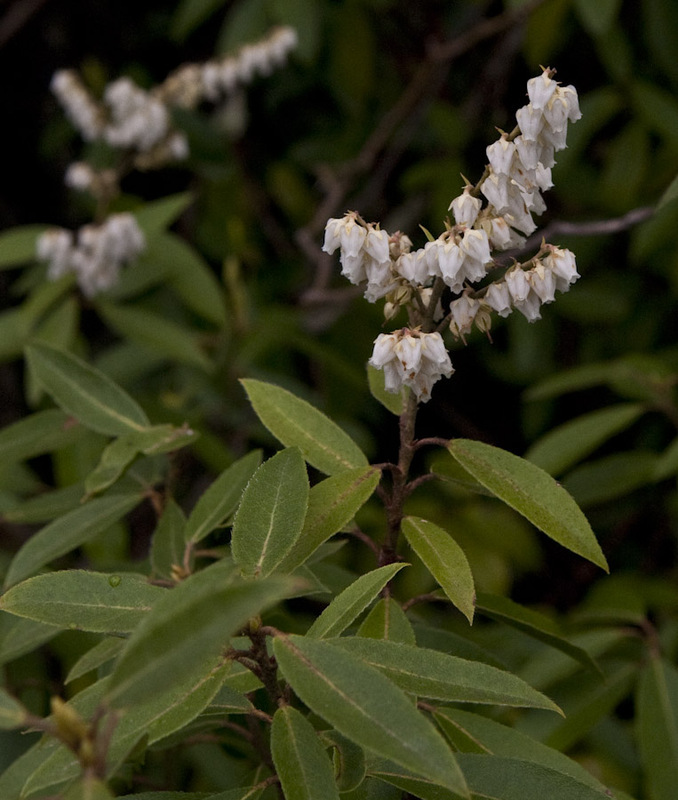 The park’s plant checklist says it is frequent at high elevations. This location is mid-elevation at best, so I could be wrong. That tiny spot of yellow in the center is a hiker who has successfully climbed half of the Cat Stairs. Now it is my turn! After the Barnes place, we follow a fairly easy trail (another old cut road) up and around the western flank of Greenbrier Pinnacle. In doing so, we transition from the watershed of the Little Pigeon River’s Middle Prong to that of Webb Creek. 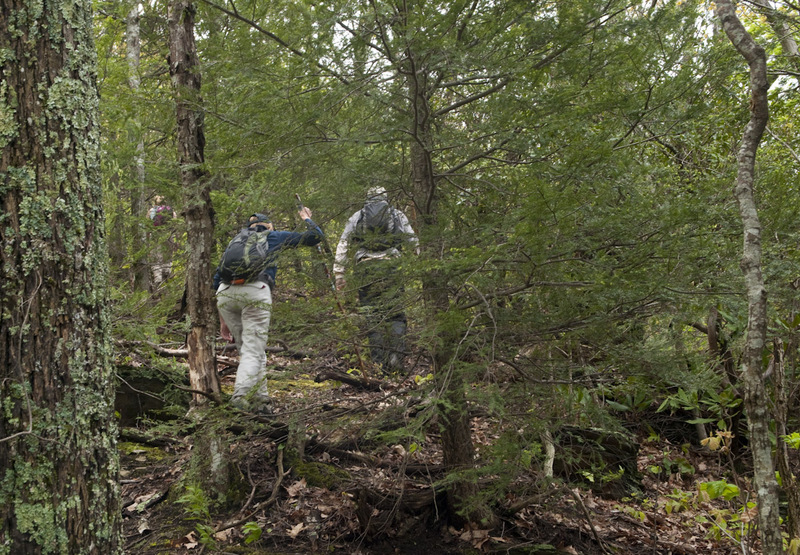 When the trail begins its descent along the Pinnacle’s north side toward Old Settlers, we head up and east, bushwhacking our way to the infamous Cat Stairs and Pinnacle Lead. There is no trail at this point, Ken tells us to find our best path and follow the steeply rising ridge. Sometimes this is easy to do, and sometimes it isn’t. I’m not very good at this type of thing as I constantly question my judgement and get nowhere fast. Without a knowing leader, I’m as good as lost, though I do locate Deerberry and Bear Huckleberry shrubs in flower. The jagged path barely visible to the left of the boulders will take me up the Cat Stairs. There are five strong hikers in our group. Ken lets them push ahead and stays behind to help the rest of us find our way. Eventually we work up and around to the base of the Cat Stairs, a series of rock boulder outcrops that we must climb. The path skirts the boulders and is a nearly straight up crawl requiring various body parts to use any rock, branch, tree, or dirt depression as an anchor or hand/knee/foothold and pull or push ourselves upward. One of the strong hikers sits at the top of a large ledge and extends his hiking stick down the trail for us to grab and successfully negotiate a particularly slippery section. At the ledge, I watch others slowly work their way up. We all rest on the ledge and eat lunch enjoying the beautiful view overlooking Greenbrier. The cliffs are covered with Rock Tripe Lichen, and there are large patches of Appalachian Rockcap Polypody. After lunch, there is still a bit more of the Cat Stairs to climb. We hoist ourselves over boulders and scramble up the last steep approach to finally walk upright along the Pinnacle Lead. 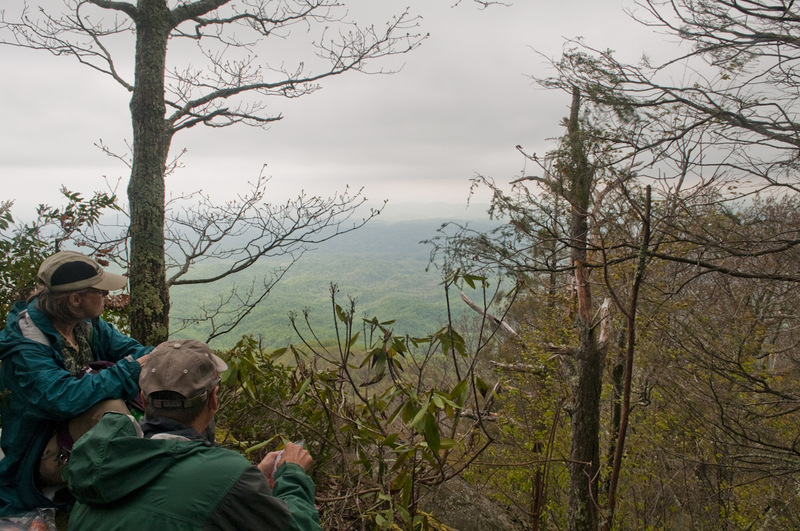 We move through acidic forests full of lichen-encrusted Mountain Laurel with pink buds, Trailing Arbutus, Teaberry, and a liberal sprinkling of Painted Trillium in full flower across the ridge. Hikers Carol and Dave Mongold enjoy lunch and the expansive view from the Cat Stairs ledge. 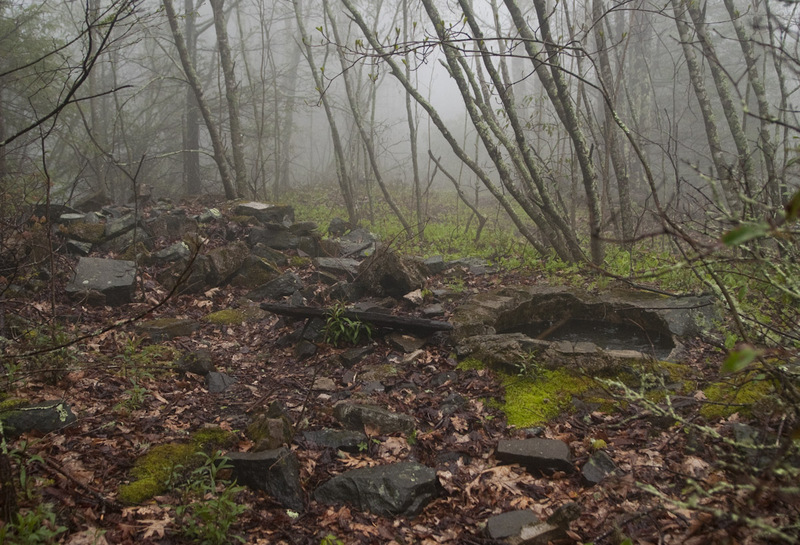 Plants capping Greenbrier Pinnacle take the full brunt of any weather moving through. To underscore this point, we hear thunder in the distance. The morning storm is long gone, and the rain stopped shortly after we began the hike. Thus far, it’s just been overcast. Now that we are on top of the 4600’ Pinnacle, more bad weather is threatening. We move briskly and soon intersect the old Greenbrier Pinnacle Trail. This was an actual trail in the park. 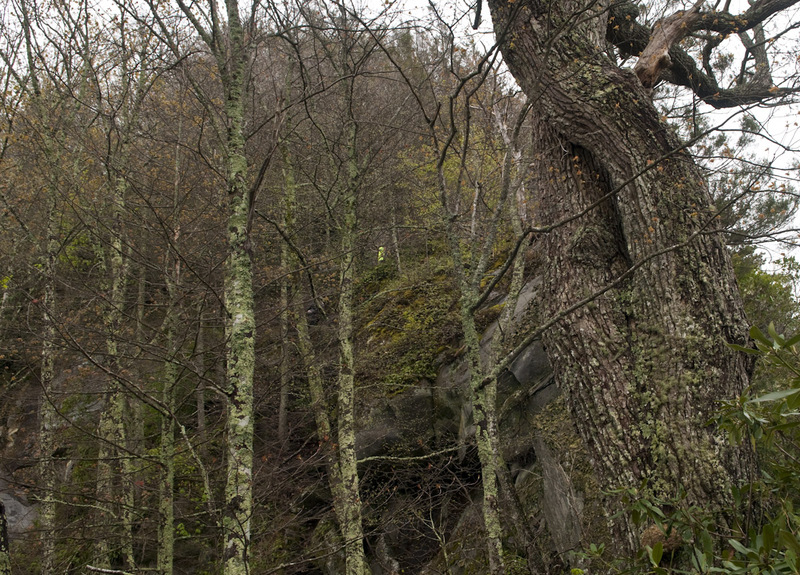 It follows on old Jeep road used to reach the Pinnacle’s fire tower. The fire tower is long gone, but the trail remained until it was closed to protect nesting Peregrin Falcons. According to Doris Gove, little brown book Hiking Trails contributor, it was later determined that closure wasn’t necessary, but due to a park policy of no “new” trail miles, reopening it isn’t allowed since other trails laid claim to that mileage in the interim. It exists today as a well-used and easily followed manway up to the fire tower site. Downfalls are the only impediments. We reach Greenbrier Pinnacle Trail about a half mile below the fire tower. The group decides to turn left and try to make the top before the storm hits. In a short time, we arrive at a level spot discussed in Ken’s book account of the Cat Stairs manway. Curious artifacts left behind long ago (tiny table/chairs and two barrels) have been removed in the intervening years. We push on to the fire tower through rhododendron tunnels, low clouds, and pelting rain. 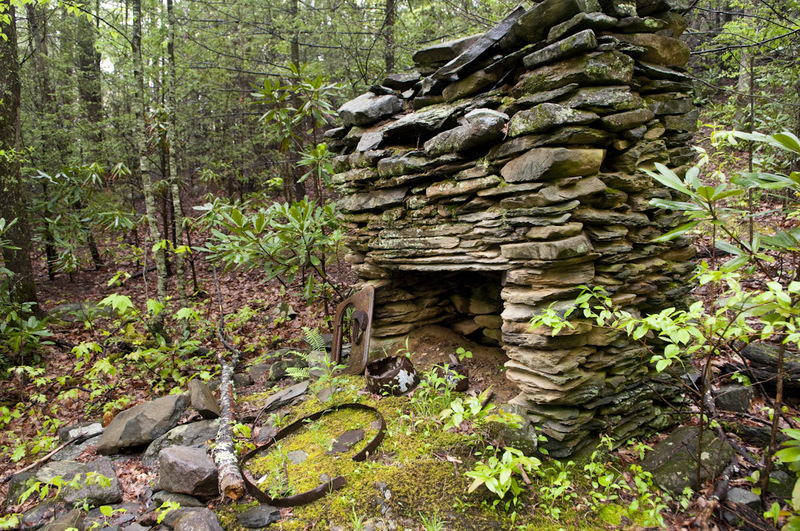 The fire tower’s concrete footings are visible and a pile of stone rubble marks the location of the caretaker’s cabin. There is a small rock cistern once used to collect rain water for the caretaker. It catches today’s rainfall, droplets puckering the water’s surface in expanding circles. There are Chestnut trees up here, and large swathes of Canada Mayflower, some in bud, adorn the ground. It is now raining hard, and we need to get off this mountain. Turning around, we quickly retrace our steps. Within a few minutes, we hear a crashing noise in the foliage and are astonished to see hailstones, many as large as the first joint on your thumb, bouncing off the ground. Thank heaven for the rhododendron cover. Nonetheless, a few chunks of ice make it through unimpeded and just plain hurt when they hit flesh. It hails for several minutes while we are still wrapped in cloud cover moving down the mountain as fast as we can. Later, a brief second wave of pea-sized hailstones hits, but we are out of the clouds and well down slope. I would love to see Greenbrier Pinnacle Trail under better conditions. It seems to traverse some fairly rich and open areas before reaching Ramsey Cascades Trail at the gravel turnaround. The strong hikers have taken car keys and gone ahead to walk the mile or so from Ramsey Cascades trailhead to our cars parked along the roadside. We thought they were well ahead of us, but we hike some distance down the Ramsey Cascades Road before they arrive in vehicles to shuttle us the rest of the way. Back in Gatlinburg, the streets are littered with leaves and twigs torn from trees during the hailstorm. Cars are dimpled. 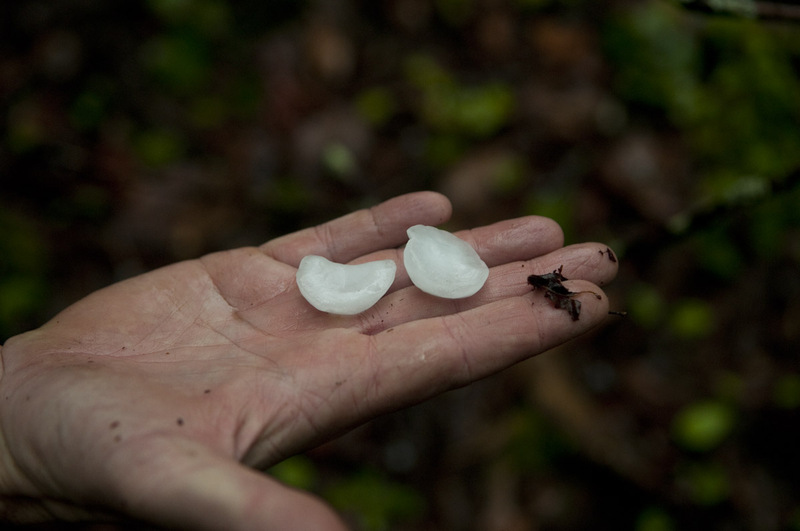 The hail was apparently widespread, as most leaders experienced it regardless of their program location — from Abrams Creek to Greenbrier Pinnacle. I ask you, does life get any better? 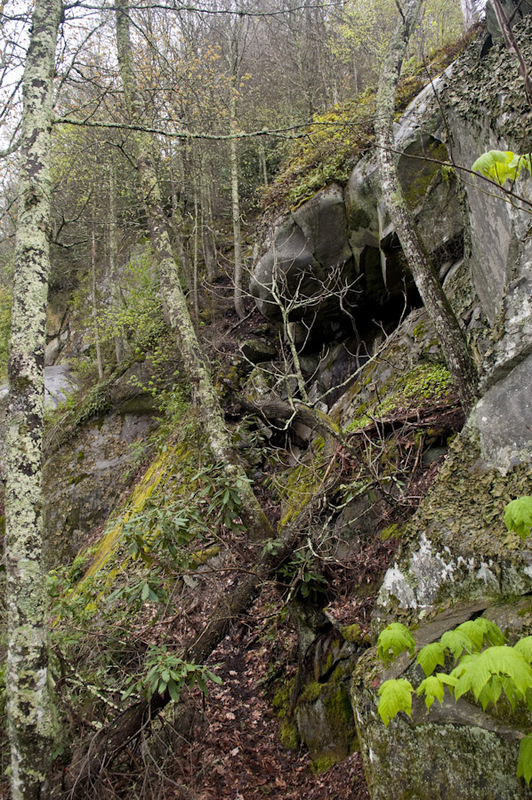 Fantastic hike over fearsome terrain, freak weather phenomenon for fascinating stories…welcome to the Smokies, baby! Another fantastic blog. You amazed me on this hike…just like a little mountain goat/ centipede. I struggled trying to go too fast,too quickly in the lower section to keep up with everyone else.I had done this section a number of times not realizing it was the bottom section of the cat stairs!! I panicked a couple times by the time we got to the actual cat stairs but was assisted by Ken who assured me I was okay and he had me. I was having trouble getting a strong foot hold in the loose soil and kept slipping back! I will be eternally greatful to the people who extended their sticks down to me and hauled me up those vertical sections with the loose soil. The Porters Creek manway to Charlie’s Bunion was harder but this hike was more challenging to me due to my fear of heights and vertigo,,,,but we did it!!! 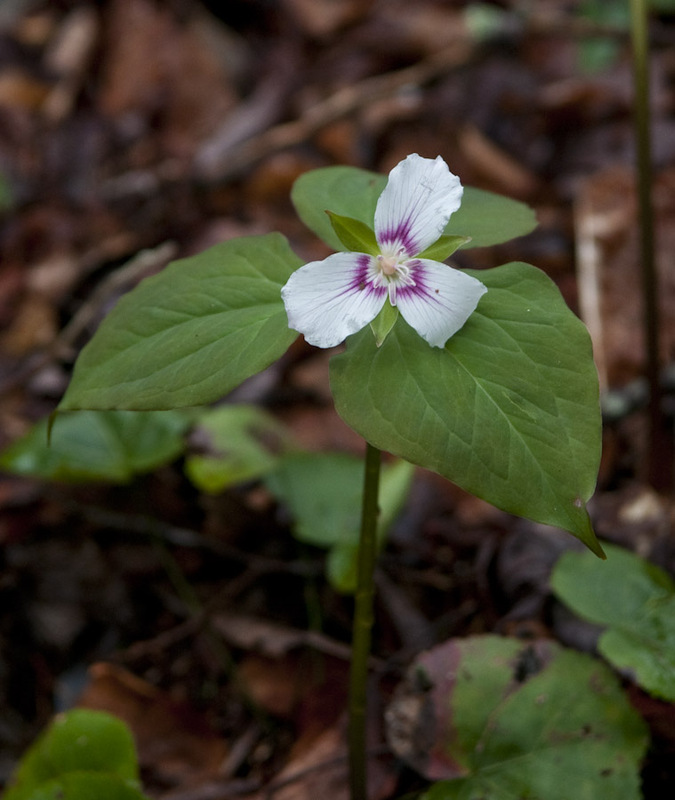 The abundance of painted Trilliums warmed my soul!